Good afternoon, space fans! It was another inspiring week of science and progress aboard the ISS. This week, the Leonardo Permanent Multipurpose Module (PMM) was relocated from the Unity module to the Tranquility module. Using the station's robotic external arm, the Canadarm2, the PMM was moved on Wednesday morning to its new home. The Canadarm was manipulated by ground teams in Houston and Quebec, then was bolted into place by astronauts Scott Kelly and Terry Virts. 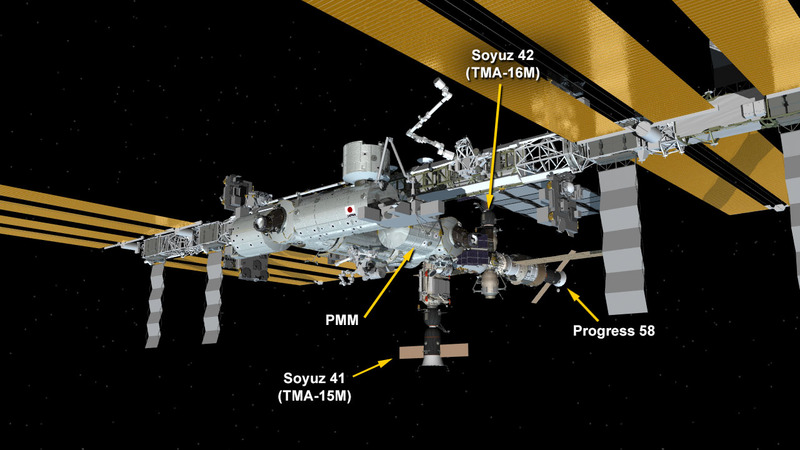 The module, which stores extra cargo for the ISS, was re-situated to allow for two new international docking adapters (IDAs) to be mounted to the modules' pressurized mating adapters #2 and #3, which will enable future spacecraft to dock with the ISS. The IDAs will be arriving later this year on the 7th and 9th NASA-contracted SpaceX cargo resupply missions. by peeking through a window in the Node 1 hatch. Science aboard the station included some interesting experiments this week. Members of the Russian crew worked on the Seismoprognoz experiment, which deals with analyzing and someday possibly predicting earthquakes from space. They also continued work on ways to acoustically determine if and where the station is hit my micro-meteoroids. The American crew worked on, among other things, the Fluid Physics Experiment, which deals with the nexus of where liquid and gas meet. Temperature differences compel the surface tension between the two elements to react in different ways, known as the Maragoni convection. Due to the ability to study such mash-ups in microgravity on the space station, the experiment offered unprecedented ability to gather more information on this scientific phenomenon. This could aid in the construction of better semiconductors, industrial processes, and biological or optical materials on Earth. Back on Earth, as Memorial Day was honored in America, Astronaut Scott Kelly took a touching tribute photo from his perch in the stars. The image of Arlington National Cemetery, where fallen U.S. soldiers are interred, may seem small in comparison from space, but is vastly important to America's heritage and heroism. A beautiful memorial from someone living in the heavens. That's all for this week, space fans! We'll see you next Sunday with more science and starlight. Watch this space! Interesting elements of Brazilian topography. Do the aliens like what we've done with the place?